Thanks to Iza Malczyk, now I am able to make this wire woven bead cap. 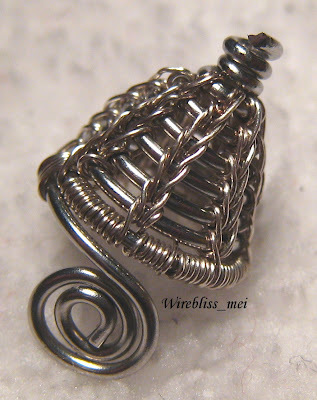 If you check out her website, you will find beautiful woven wire jewelry of various designs. They are all so very beautiful. 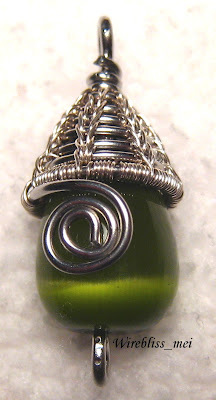 Her tutorial on this wire woven bead cap is very easy to follow but to actually make them is not as easy as it looks. Hopefully with practice, the time required to make this type of wrapping will be shortened. That looks terrific! You did a great job on it. I have that samee issue with the tutorial and haven't tackled it yet. Her work is fabulous! Thanks Francesca. Her work is awesome and she has been kind to share this tutorial. All the best to you when you try this one out. Wow... it looks great! How do you get the bead to stay inside it? 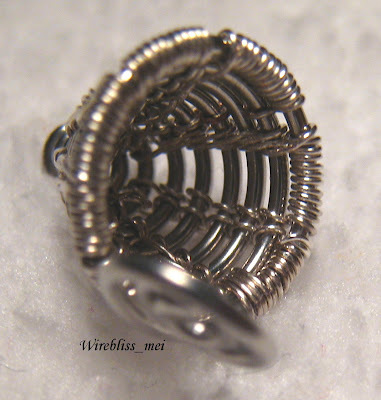 Its the bigger wire at the center, inserted from the top of the cap and through the bead. To hold it in place, bend a loop at the bottom of the bead. This is amazing thing You did. Thanks Karnaaks. Like you, I really admire Iza's work and talent. I wonder did you start from bottom or from the top of this cap. Thank you Zlatnaribrica. I started the cap from the top. I checked out your link and wow! you make beautiful pieces there. Bookmarked your site!